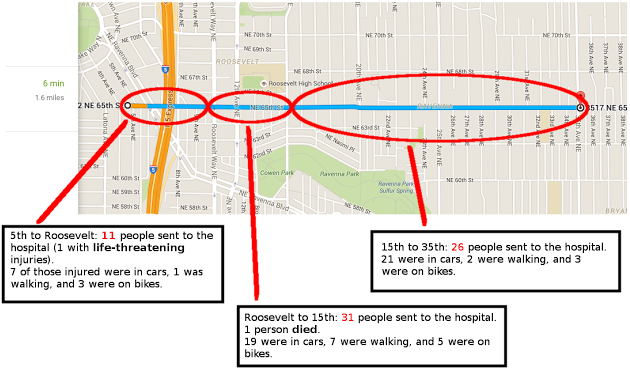 If you have been to Green Lake, you probably walked, biked, or drove through the Starbucks intersection (NE Ravenna Blvd / NE 71st Street / E Green Lake Way/Drive). This intersection is confusing, uncomfortable, and dangerous. Because La Escuelita Bilingual School is right next door, and since many sports teams and families use the play fields nearby, fixing this intersection is a huge priority for Green Lake & Wallingford Safe Streets (GLWSS), a brand new member of the Seattle Neighborhood Greenways coalition that re-formed early this year. Since February, GLWSS has focused on the impending 2019 re-paving project that will see the installation of two-way protected bike lanes around the entire east side of Green Lake. 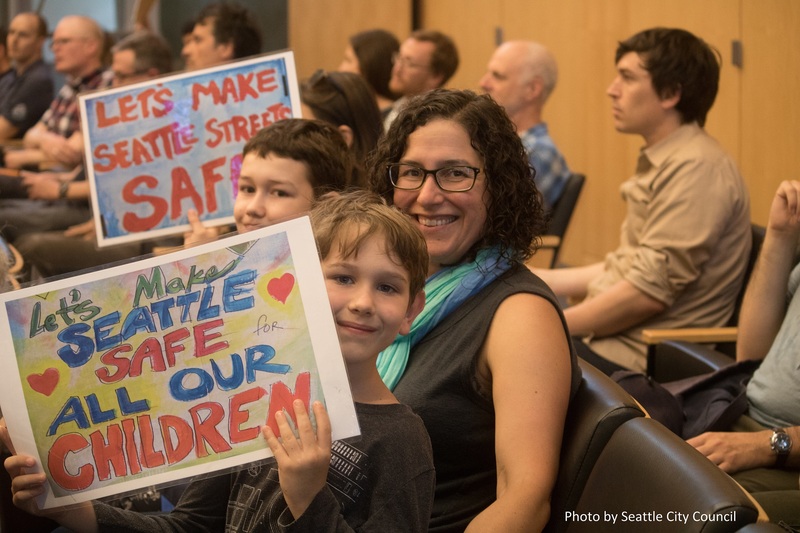 While we support the project as a whole, our group has several proposed changes to the SDOT plans which would make the park, playfields, and business district safer and more accessible to pedestrians and people on bikes. By slowing speed limits, narrowing the car traffic lanes, and “squaring up” several intersections, this project will now result in greater predictability, visibility, and safety for all users. 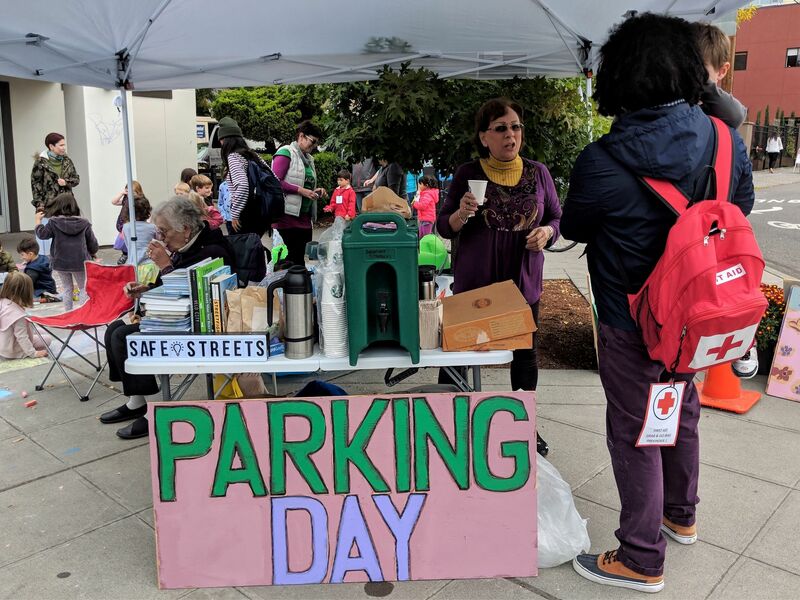 On PARK(ing) Day in September, we hosted two pop-up parks — one at the Starbucks intersection and another at the Kidd Valley intersection (N 50th Street / Stone Way N / Green Lake Way N). 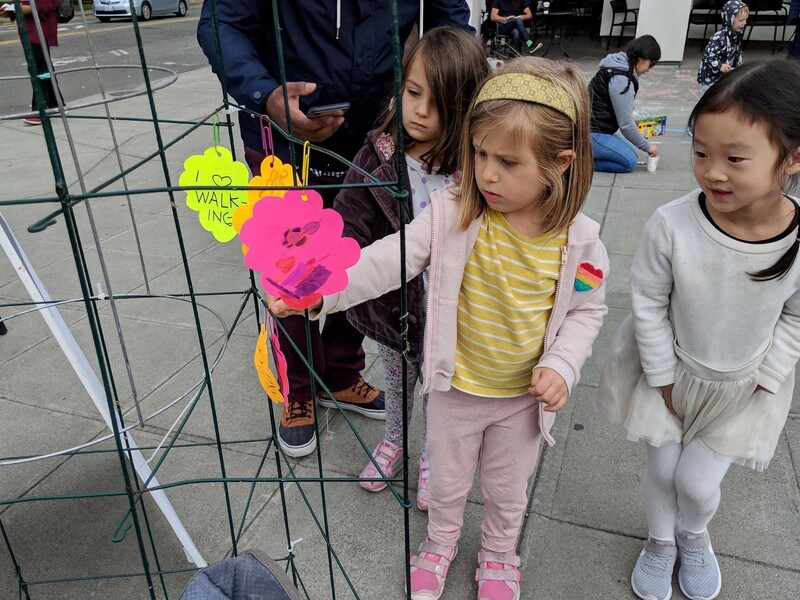 One of the goals of PARK(ing) Day is to encourage residents to re-imagine their streets — exactly what we had been doing all summer as we talked with our neighbors about redesigning the two troubled intersections. Our small but mighty team of volunteers planned and organized a park at each of these intersections: next to Starbucks in the morning and in front of Kidd Valley in the afternoon. With generous donations from both of these business, we were able to provide coffee to our morning visitors and milkshakes in the afternoon. We invited the students from La Escuelita to join us and add to our community art project. We set up a putt putt course in front of Kidd Valley and rewarded golfers with a coupon for a free milkshake. We had a great time transforming these spaces in the streets into places for people to gather and enjoy themselves. the potential in their streets. Following a successful summer of community outreach, the Green Lake & Wallingford Safe Streets Group leadership met with SDOT project managers and went over the 60% design for the re-paving project — including many of our suggestions. 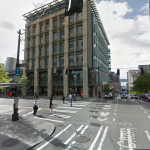 We are very happy to see the Starbucks intersection will be much safer in 2019, and the proposed stoplight added at N 52nd Street has been removed from their plans. These are big wins for our small group! Unfortunately, we learned in November that SDOT removed the bike lanes from the street design for N 40th St. We’re distressed at the precedent of removing a route designated on the Bicycle Master Plan, and awaiting more news from SDOT in early 2019. If you’d like to get involved, visit us at GLWstreets.org and drop in on our monthly meeting! 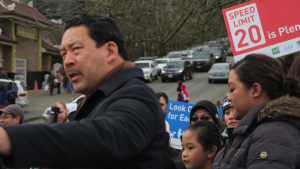 We’re going to keep moving forward with our primary task: to make the streets around Green Lake and Wallingford safer for people of all ages, abilities, and transportation choices. 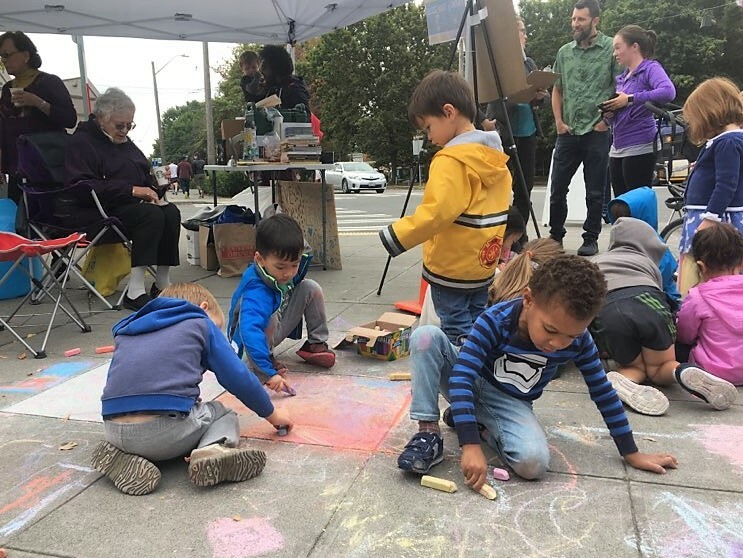 Remember — one important role of our community group is to educate our neighbors about current transportation projects, build community connections, and get people thinking in creative ways about how we use our streets. Urgent: Safer bike lanes downtown are in jeopardy. 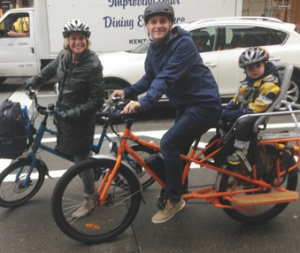 Click here to send a message to government leaders who are on the fence about whether to go forward with protected bike lanes on 4th Ave downtown. When protected bike lanes were added to 2nd Ave following the tragic death of Sher Kung, not only did 2nd Ave become much safer but the number of people biking jumped dramatically and just increased by 30% again this year. We have the same opportunity to create protected bike lanes on 4th ave to make it safe and comfortable for people of all ages and abilities to access downtown jobs, and destinations like the flagship library, the downtown YMCA, City Hall, and the Cinerama just to name a few. If built along with other parts of the #BasicBikeNetwork, the city expects to more than double the number of people who bike downtown by 2023. And we also know that protected bike lanes make it safer to walk too by separating car turning and walking signal phases. The city and region spent years of planning and millions of dollars to come up with a comprehensive plan that will improve transit travel times by 40%, move more people overall, and make it safer to walk and bike downtown. This week, 1000 new orange and green bikes will be magically scattered like confetti throughout Seattle. @LimeBike has a track record of launching dock-less bike share systems. @SpinCities says it raised $8 million for bike share and eventually wants a fleet of 10,000 bikes in Seattle. 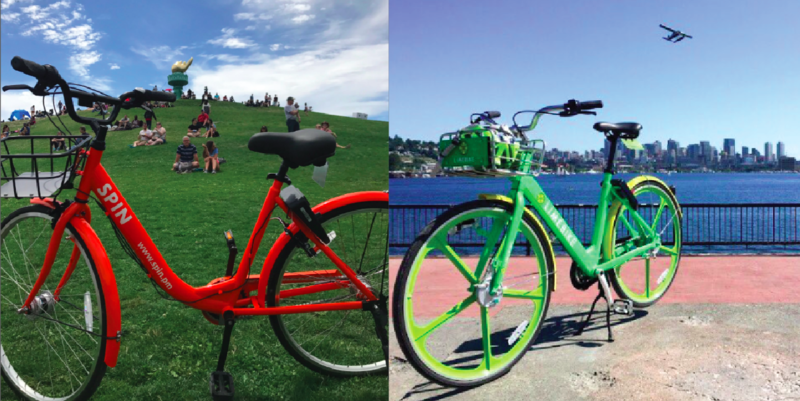 Seattle is the largest market to date for both companies, and Spin and LimeBike will be competing head to head. Each company is allowed to launch a fleet of 500 of their distinctive bright green and orange upright bikes today, another 1,000 next month, and 2,000 the following month. The beauty of dock-less bike share is the fact you can find a bike anywhere in the service area with an app, unlock a bike with your phone, and ride anywhere for 30 minutes for $1. No search for parking, just find a bike and ride. My biggest worry is safety. Not safety of the bikes, that feel solid and reliable, but street safety. 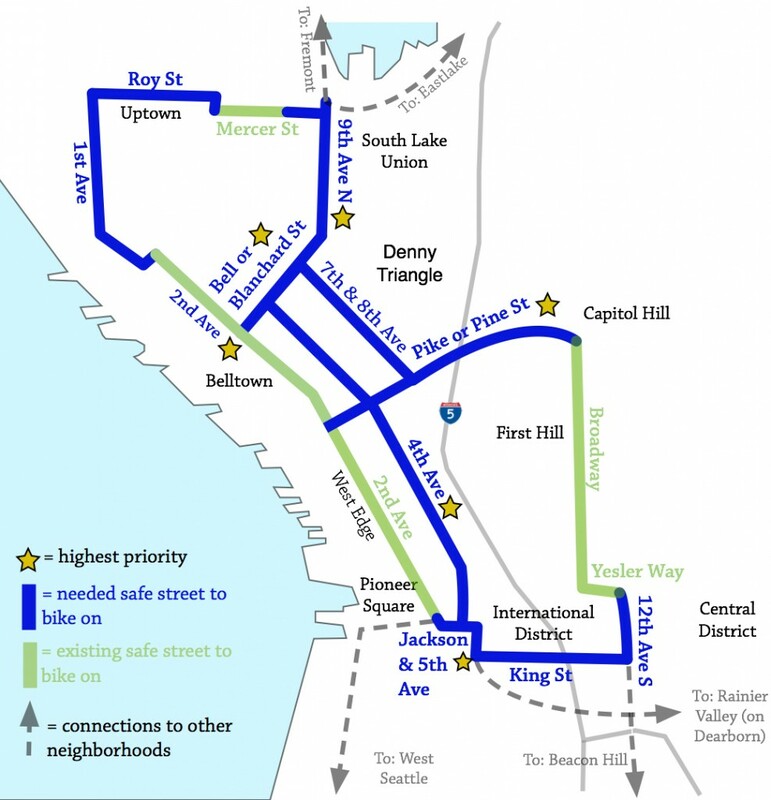 The new bike share service areas in Downtown, Central Seattle, Columbia City, Beacon Hill, South Lake Union, Eastlake, Fremont, Ballard, the U-District are filled with high crash corridors and intersections with few miles of protected bike lanes, trails, or greenways. My hope is the thousands of new Spin and LimeBike riders will encourage people driving to become more aware and respectful of people on bikes. 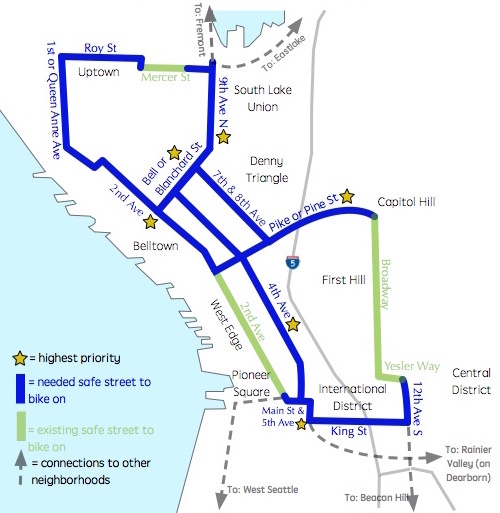 I also hope SDOT will quickly build out a fully protected #BasicBikeNetwork downtown and a linked safe network throughout Seattle. Most of all, I hope thousands of people will discover the joy of riding a bike for everyday transportation. 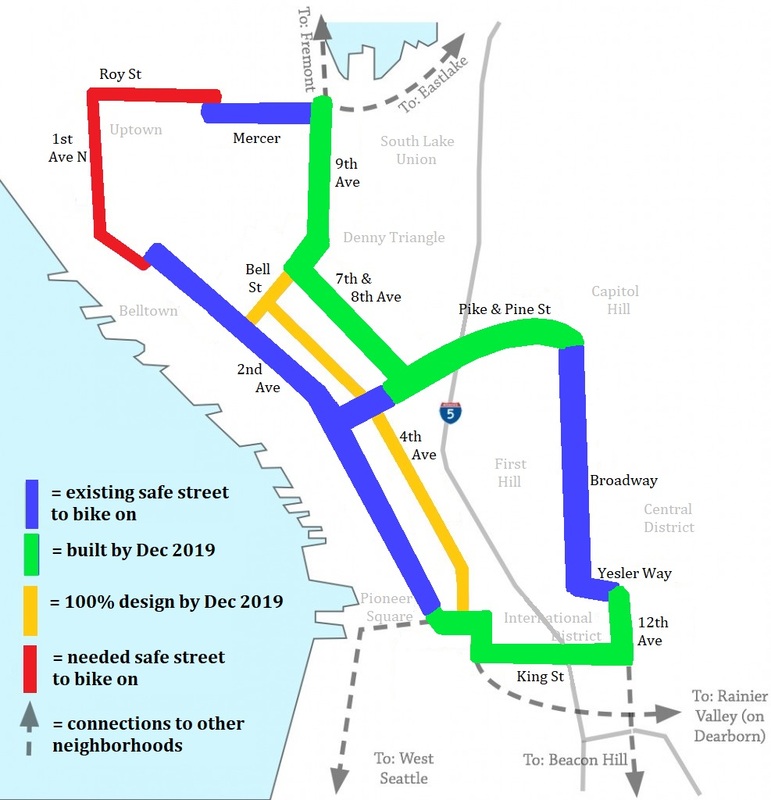 Ready for a downtown #BasicBikeNetwork? Urban Village Bike Map connect the dotted lines! 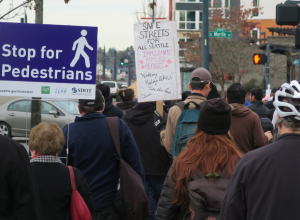 Memorial Walk for highlights why safe streets are not gentrification. 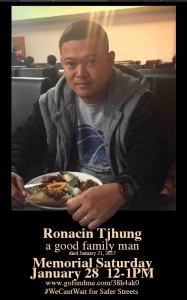 Ronacin Tjhung, was hit and killed in January 2017 while riding his bicycle between his two jobs in the Rainier Valley. Ronacin had been providing for his children by working 60 hours a week and sending money back home to the Philippines. His five children, who lost their mother to Typhoon Haiyan in 2013, will remain in the Philippines. What was once a crowd-funded site to raise money to support Ronacin’s family and pay medical bills is now a fund to fly his body back home and pay for his funeral. Here’s a link to Ronacin’s GoFundMe crowd-funding site. 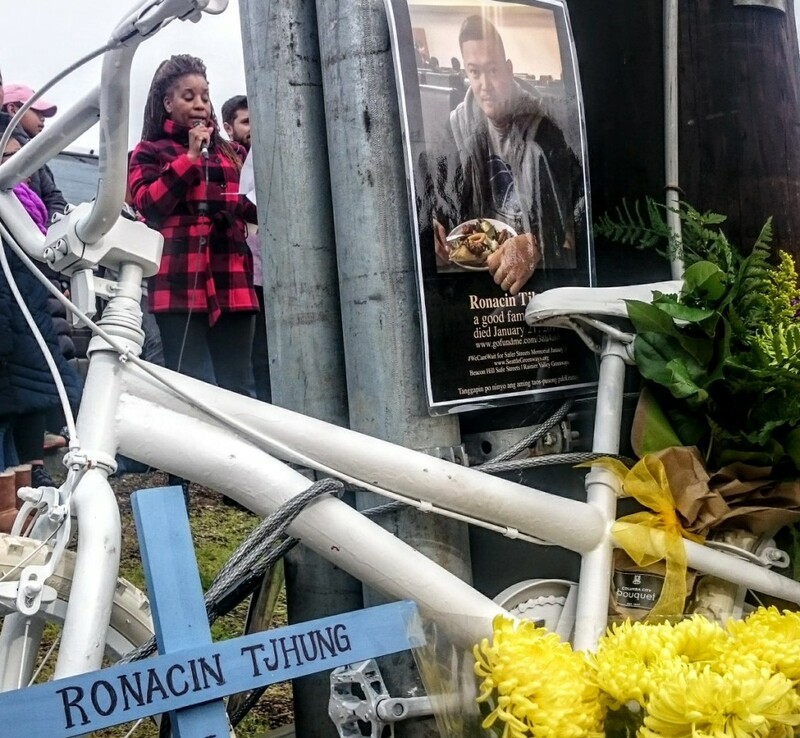 Ronacin’s large family attended a Memorial for him, organized by Beacon Hill Safe Streets, Seattle Neighborhood Greenways, and Rainier Valley Greenways. Ronacin’s mother, sister, brother, and step-father, along with his extended family, the Filipino Team MANG cycling club, and impressive numbers of people representing local safe streets groups throughout Seattle walked from the Othello Light Rail Station to South Graham Street on Martin Luther King Avenue South, near the spot Ronacin was hit by a car driver. Robert Getch from Beacon Hill Safe Streets did a stellar job organizing and speaking. He was eloquent about the need for safer streets and about his grief at the loss of a valued family man. 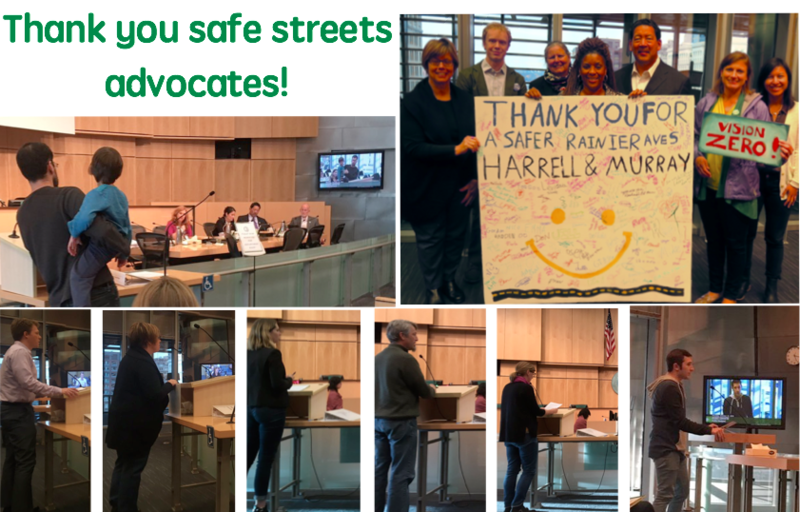 Phyllis Porter represented Rainier Valley Greenways and spoke about how “safe transit, bike lanes, sidewalks, and other safety infrastructure is NOT gentrification, but an important right for all. Central Greenways Shirley Savel spray-painted a ghost bike, and Adam Dodge set it up at the place Ronacin was killed. Councilmember Kshama Sawant spoke about why working people needed to be able to have transportation options late at night, especially in low income, culturally diverse areas where access to cars is prohibitively expensive and transit is not reliable during the late night and early morning shifts of many service jobs. She brought up the need for a safe, direct bike route through Rainier Valley, and the importance of signals that would help people cross MLK more quickly and safely. Council President Bruce Harrell offered words of comfort to Ronacin’s family, encouraged them to keep involved in making Seattle a better city. 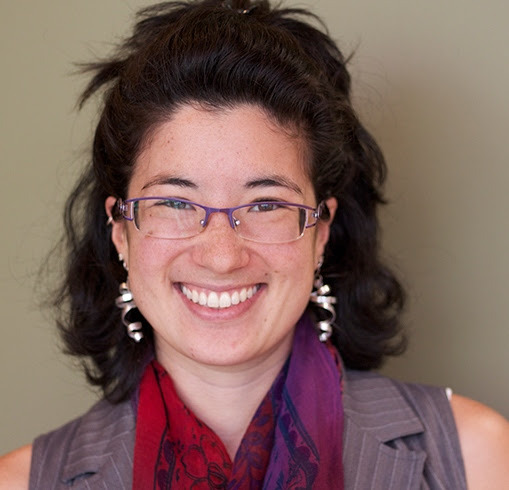 Council member Rob Johnson’s staff Amy Gore attended, as well as CM Sawant’s assistant Rebekah Liebermann. Seattle Police accompanied the group and Dongho Chang represented the Seattle Department of Transportation. Ronacin’s sister Jessica told a little about his life, his boss at McDonald’s spoke about his humor and dedication, and Ronacin’s mother reached out for hugs from the 70 people at the Memorial. 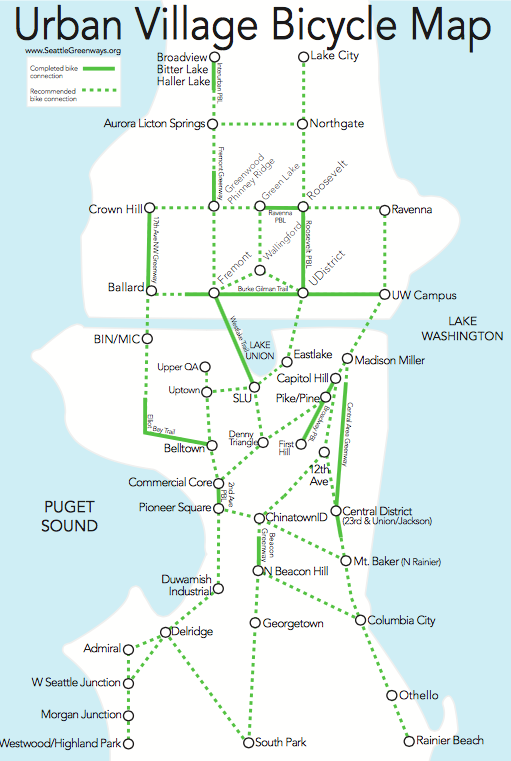 The Seattle Bicycle Master Plan includes recommendations for protected north-south bicycle lanes through Rainier Valley, but a direct bicycle route has never been built. 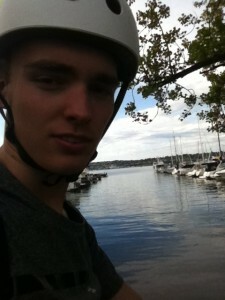 My name is Max Albert, I am a Dutch student who is currently doing an internship at Seattle Neighborhood Greenways. I have ridden my bike on a daily basis ever since I was 4 years old and would say I am extremely comfortable on it. In case you haven’t heard of the Netherlands, its literal translation from Dutch is “low lands”, meaning that there are almost no hills. When coming to Seattle I naturally had the intent to ride my bike everywhere, without a helmet of course. However, this quickly changed as I first explored Downtown. The sight of people blending in with cars on the busy roads and flying down the hills was a completely different sight from what I was used to, and made me think twice about my previous made statement about riding my bike everywhere. I had been warned that it could be dangerous but this was truly something else.